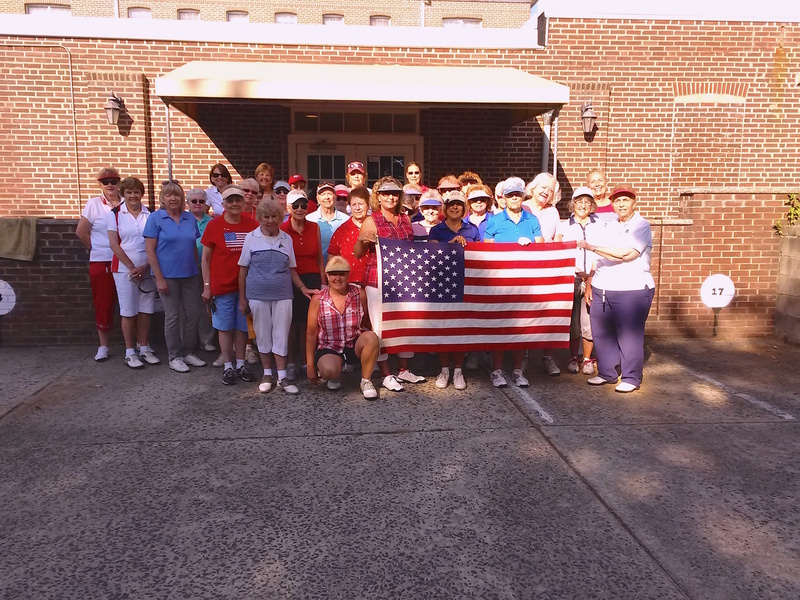 In June the Pine Ridge Ladies Golf League of Lakehurst, NJ held a charity golf event at Pine Ridge Golf Course on Joint Base McGuire-Dix-Lakehurst Naval Base to benefit Solider On. Women from Leisure Knoll joined the Pine Ridge Ladies for the event. The group of 38 women played a 9 hole golf game with prizes for longest drive on hole #1, closest to the pin on hole #8, and low gross, as well as chip in awards. The longest drive was won for flight A and B by Arlene Key and for flight C and D by Joanne Larkin. Closest to the pin was won by Rita Cashman. Low gross was won by Laura Dickinson for flight A, and Kathy Nielsen won for flight B.
Chip-ins were won by Ethel Donlin and Nancy Wong. The event chairperson was Cathy Linden with assistance from Nancy Eldridge, Kathy Nielsen and Betty Valentino. Following the event and awards, everyone enjoyed a lunch and desserts in the clubhouse. The day was enjoyed by everyone and over $1,000.00 was raised. Nathan O’Leary from Comcast Newsmakers interviewed Jack Downing, CEO at the Majestic Theatre in West Springfield. 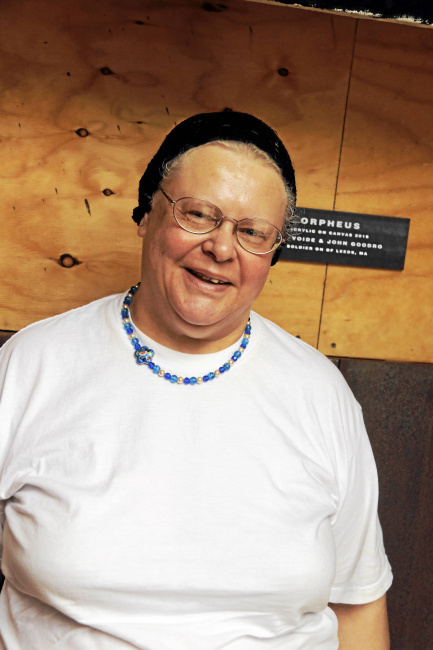 NORTH ADAMS – United States Army veteran LouAnn Hazelwood termed her professional acting debut “a Cinderella story.” Hazelwood’s birthday is July 5, and over the past year, her life has changed dramatically. Hazelwood and about 75 other community residents opened the play, “Orpheus in the Berkshires,” on Thursday at the new Greylock Works venue, 508 State Road (Route 2). The run for the hour-long play continues tonight at 7:30 and concludes at 5 p.m. on Sunday, and is free to the public. In the play, Hazelwood will act the part of one of the grandmothers looked after by Orpheus. These performances are part of a community engagement initiative launched by the Williamstown Theatre Festival and led by Obie Award-winning playwright, Lucy Thurber, and festival associate director, Laura Savia. Additional cast members and materials were contributed through partnerships with the Williamstown Youth Center, the Williamstown Council on Aging; the Osher Lifelong Learning Institute and Rock On band camp, both based at Berkshire Community College, and others. Theater festival actors round out the cast. Hazelwood participates with the Soldier On program based in Leeds. 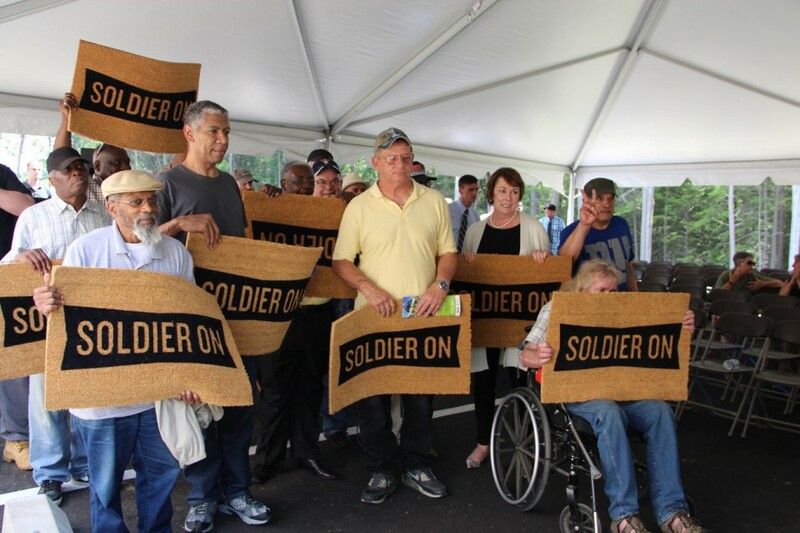 Launched in 1994, Soldier On is a private nonprofit organization providing homeless veterans with transitional housing and a number of support services. In 2010, Pittsfield became host city for the organization’s Gordon H. Mansfield Veterans Community, a permanent housing endeavor providing formerly homeless vets with affordable, sustainable homes. Solider On offers a women’s program, men’s program, an incarcerated veterans program and a resiliency health program. This partnership holds much promise, Savia said. Among those are Ray Voide, a 56-year-old U.S. Marine Corps veteran, and United States Navy veteran John Goodro, 51. 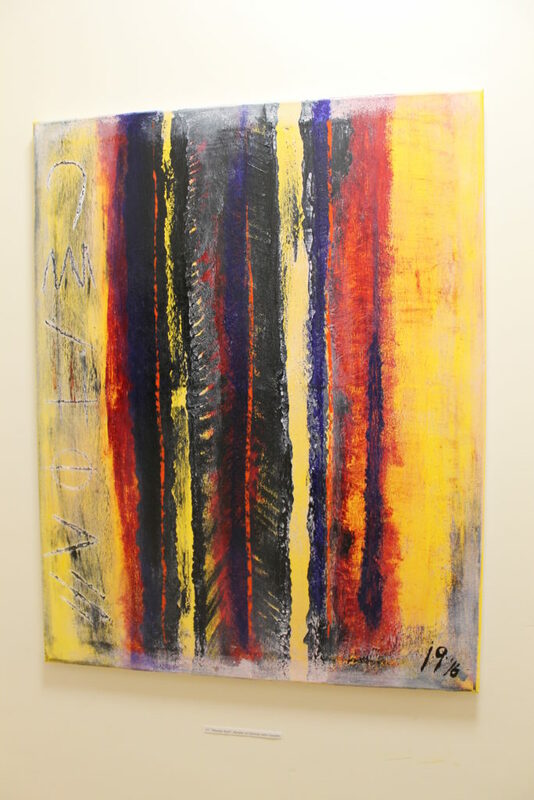 The two combined artistic talents to create “Palette,” a painting displayed at the Greylock Works entrance for the duration of the performances. Voide has been involved with Solider On since December 2015, and spoke about how the design was created. In February, Hazelwood, Voide and Goodro began traveling to Pittsfield with other members of Hanford’s art group, to attend a workshop series led by Savia and Thurber, The experience was life-changing, they said. With encouragement, Voide’s photograph became a painting. Voide and Goodro painted the piece together. When the finished work was delivered to the play venue recently, the moment created a once-in-a-lifetime memory, Goodro said. “It was exciting,” he said. Goodro said he has been with Soldier On since December. 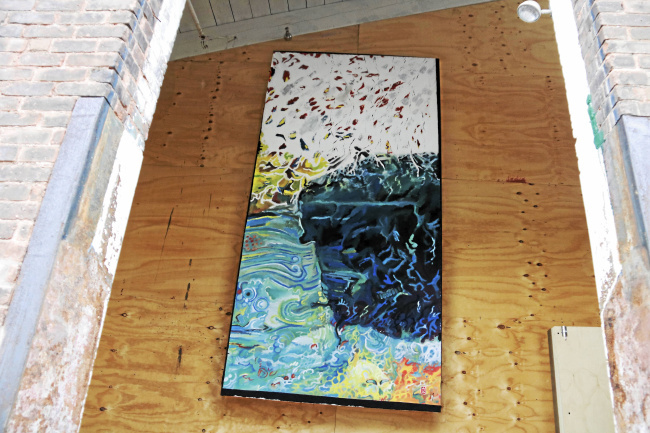 “When we delivered the piece, John turned to me and said, ‘I feel big,'” Hanford said. Hanford said he believes the veterans possess the creative spark. Working with the theater professionals felt right for Hazelwood, she said. Hazelwood has benefited greatly from the partnership, said Women’s Program Director Sara Scoco. And that is the gift of the arts, said Savia. 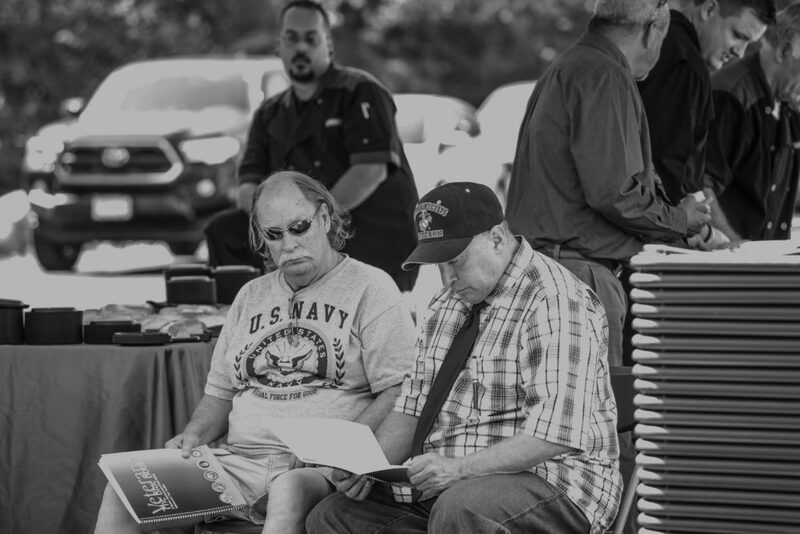 Tom Glassmire (left) sitting with Chris “Cappy” Leos at the June 29th Gordon H. Mansfields Veterans Community dedication ceremony in Leeds, MA. Chris “Cappy” Leos was born in Boston, MA on July 28, 1958. Raised in Tewksbury, MA Chris excelled in sports as a young child. Chris played football, basketball, but truly excelled in baseball where he played third base at Tewksbury Memorial High School. During his high school career Chris only struck out once and he was later inducted to the hall of fame. Being from Massachusetts he is a loyal Boston Red Sox fan. Chris fell to peer pressure when he was a freshman in high school and started partying. He quickly learned that he was capable of drinking more than the other kids his age. He knew he had a problem, but enjoyed partying too much. The partying and drinking is what ruined Chris. College baseball scouts sought him out, but Chris turned down the offers. In 1975 he joined the Marines where he worked in intelligence and communications with top secret clearance. During his time within the Marines, Chris married his childhood friend who was a tap, ballet, and jazz dancer. When Chris left the Marines in the 1990s he went to work for United Stationers Supply Co. where he was a floor supervisor. He was also the assistant varsity coach of the Tewksbury Memorial High School baseball team. While working and coaching Chris continued to drink on a daily basis. After 17 years of marriage Chris and his wife grew apart from each other. After the divorce Chris moved around between Methuen, Burlington, MA and Hampton Beach in New Hampshire. In 2010 Chris ended up renting a room in Haverhill, MA which is where he had his wake up call. Chris quickly learned that the house he was renting a room in was a crack house. While he never did drugs he found he was isolating himself, stayed in his room and continued to drink. It wasn’t until his best friend, Steve Scilbilia, coaxed him into going to the Bedford VA Hospital by telling Chris they were going to the 99 Restaurant for lunch. Chris had no idea about the VA and the services that were offered to veterans. With a little hesitation Chris admitted he needed help and started his journey to recovery. “Came to Believe.” He assists as many residents as he can and is a promoter of engaging recovery to stay sober. Chris has now been clean for the past 15 months. Art lovers, and friends and supporters of Soldier On veteran artists, gathered at the Hilltown Community Development Corporation in Chesterfield on Thursday for an art open house that showcased 45 art pieces from 12 participating artists. “It is great for the vets to experience creating art, but it is also nice for them to experience other people appreciating their work,” he said. Soldier On’s mission is to end homelessness among veterans by providing transitional and permanent, sustainable, safe, and affordable housing that veterans own and operate with support services. The Soldier On’s Veterans Community Art Initiative engages homeless veterans in the arts and cultural activities to promote healing and expand veteran’s social and personal networks of support. For the last three years, artist in residence Nathan Hanford has been working with several veterans in the program making a wide variety of art supplies available and offering artistic assistance to anyone who cares to participate. Staff at the Chesterfield facility said they were impressed with the quality of the art work. One couple did just that. 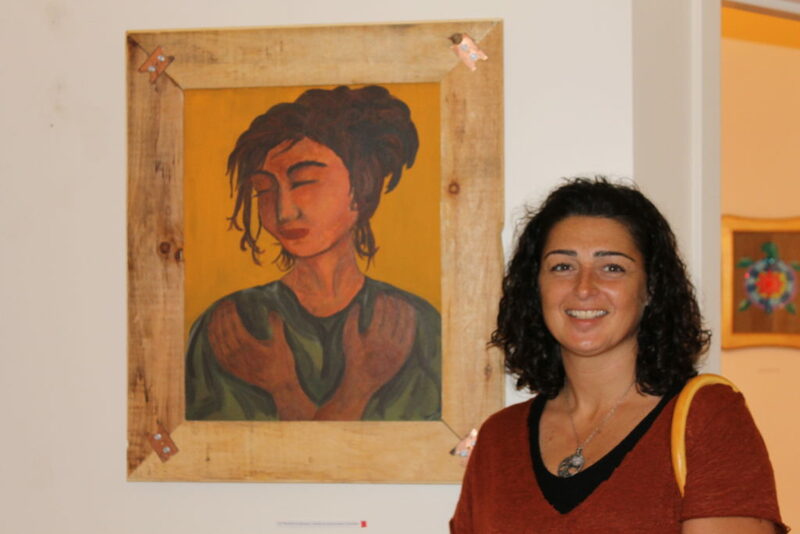 Brian and Meaghan Cooper of Pittsfield said a painting by Army Reserve veteran Dawn LeHouiller “just spoke to them,” so they bought the piece, entitled “Portrait of a woman,” for $200. “We came to support Solider On because we think it is an amazing program,” Meaghan Cooper said. The couple was surprised when the artist walked in just as they were purchasing her painting. “I saw this woman walk in and I thought that she looked like the lady in the painting. It was wonderful to find out that she was the artist!” Brian Cooper said. LeHouiller said that she was just as surprised that one of her pieces had sold. LeHouiller said that Hanford’s work with vets has profoundly changed how many of the participants view themselves and their capabilities. The show currently has no end date but will continue to run for at least the next several weeks. All proceeds from art sales go directly to the artists. For information on open hours call the HCDC at 296-4536. Bethlehem – As Jerry McCluskey sprays lubricant on machines or laughs with his co-workers, he looks no different from the other mechanics at the paving and construction company where they work. McCluskey grew up working on cars in Schoharie and was a technician in the Army. The president of Callanan Industries regards him as a dedicated employee, and McCluskey says everyone has made him feel welcome at his new job. But when the 34-year-old veteran arrives at 7 a.m., five days a week, he steps out of an Albany County Correctional Facility vehicle, and when he leaves at 3:30, he is transported back to the jail where he is serving a two-year sentence for driving with 26 license suspensions. He is the first in a collaboration among the Albany County Sheriff’s Office and Soldier On, a privately funded veterans advocacy group, as well as Callanan, to employ incarcerated veterans while they complete their sentences in a ground-breaking program that Sheriff Craig Apple said is attracting attention from other agencies across the country. On Thursday, Apple announced the Second Chance Veteran Inmate Work Release Program at Callanan’s mechanic garage in Selkirk, where McCluskey earns $15 an hour — money he uses to pay off fines and saves for life after jail. The goal is to drive down recidivism rates and prepare incarcerated veterans for employment. Of about 200 veterans who have passed through Soldier On’s counseling services at the jail in the last two years, only four have returned. Yet, this is the first time the jail has allowed outside companies to hire inmates as full-time employees. Although McCluskey was sentenced to two years in jail for two counts of felony first-degree aggravated unlicensed operation, he can get out by September with good behavior. Through the new work-release program, he is also guaranteed employment at Callanan after serving his time. Callanan President Don Fane, who proposed the program to the jail because of difficulty filling positions and a determination to help veterans, said McCluskey and others can apply their military training to the workforce. McCluskey said he wants to counsel inmates through Soldier On once he is released. He wears a bright orange Callanan T-shirt and green cap and is grateful to be a part of the Callanan team. NORTHAMPTON — James Oliver’s home burned down five years ago in upstate New York, leaving him homeless. The 60-year-old Vietnam veteran migrated to the Soldier On homeless shelter on the grounds of the VA medical center in Leeds, not knowing where his next permanent home might be. 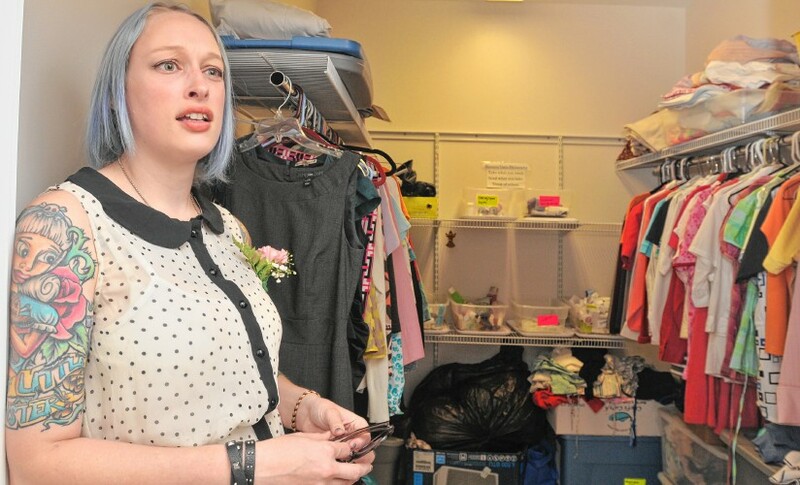 Katrina Dore, 38, a U.S. Air Force veteran, left an abusive marriage and eventually found space in Soldier On’s former transitional home for women on the VA grounds after spending considerable time on the streets. “I was living out of my car, all the way from Kentucky to Vermont, wherever I could stay,” said Dore, a New Hampshire native. Oliver and Dore are the new faces of Soldier On’s first homeless veterans ownership housing on a VA campus, and the new Women and Children’s Housing Unit, which represents another innovative housing concept for veterans. “Four and a half years I have waited for this,” Oliver said of his new home at the 44-unit Gordon H. Mansfield Veterans Community, where about 150 people gathered for a dedication ceremony Wednesday. The facility allows veterans who have been successful in the Soldier On program to purchase an equity stake in their homes. The idea is for veterans to become homeowners while surrounded by the support services they need throughout their lives. The nonprofit organization built its first such development in Pittsfield, a 39-unit facility that is also named after Mansfield, a decorated veteran and former deputy secretary of veterans affairs who died in 2013. The ceremony outside the newly built townhouse-style homes was marked by several impassioned speeches from local, state and federal officials, as well as John “Jack” Downing, chief executive officer of Soldier On. “We’re trying to make a difference in the place we live,” Downing told the crowd. “The more we give, the more we chip away at the barriers. The keynote speaker was retired Col. David W. Sutherland, a former special assistant to the chairman of the joint chiefs of staff. Sutherland gave a powerful account of his own combat experience in two wars, particularly in Iraq, and the sacrifices of the men he commanded who put their lives on the line, for their country and, in one case, for him. Sutherland recounted examples of veterans and their families who fell on hard times, and stressed why the new housing model built by Soldier On, in collaboration with the VA Central Western Massachusetts Health Care System, is important to providing veterans with dignity and respect in their lives. “The power of humiliation when you don’t fit in can be overwhelming,” he said. “This is potential, not pity, and recognizes that sometimes people need a hand up, not a handout. “We will not tolerate another generation of homeless veterans,” Sutherland said. Other speakers included U.S. Rep. James McGovern, D-Worcester; Lisa Pape, national director of homeless programs at the U.S. Department of Veterans Affairs; Francisco Urena, the state’s secretary of veterans’ services; John Collins, director of the Veterans Affairs Central Western Massachusetts Health Care System; Michael Gondek, vice president of the Life Initiative; and Northwestern District Attorney David Sullivan. “Remember every day you live here, it’s your home,” Sullivan told the veterans shortly before they were presented with Soldier On welcome mats. Charlsey Mitchell walks up to the dedication for the new housing with other veterans. Behind her is the housing for the female veterans. Although the men who will own and occupy the approximately 410-square-foot units at the Gordon H. Mansfield Community have not yet moved in, 15 women have taken up residence since December in Soldier On’s Women and Children’s Housing Unit just down the hill. A 16th is expected to arrive this week, bringing the development to capacity. Lou Ann Hazelwood, 60, is the oldest veteran living at the women’s transitional housing, which currently has no children in residence. She said the tenants support each other, hearing each other’s problems and helping solve them. “We have women coming from all walks of life in all different situations,” said Hazelwood, a U.S. Army veteran who hails from New York and who has been involved with the Soldier On program for four years. Many of the women living in the transitional housing have been diagnosed with post-traumatic stress disorder, have a history of substance abuse, or been victims of domestic or military sexual violence. About a dozen of the woman earlier lived in transitional cottages run by Soldier On on the VA campus. The program provides a variety of wellness programs, including stabilizing mental and physical health, group sessions on building self-esteem, and programs geared toward education, job training and employment. 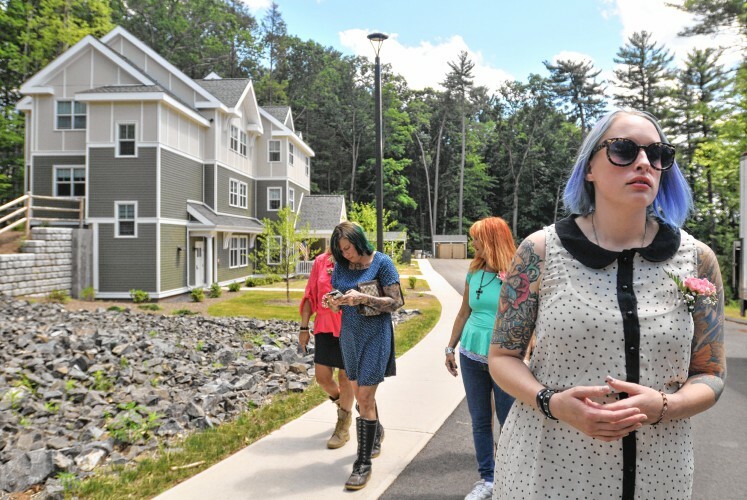 There is a waiting list to get into the housing and programs, and women will typically stay in such transitional housing about a year on average, said Sara Scoco, director of Soldier On’s women’s program, during a tour of the property. “Typically, women stay longer because they come to us having lost everything — all sense of self-confidence and self-esteem,” Scoco said. The youngest of the residents is 27-year-old Charley Mitchell, who grew up in Holyoke and enlisted in the U.S. Navy right out of high school, and is planning to become a certified nursing assistant. A former crew chief on U.S. Navy planes, Mitchell came to Soldier On from a substance abuse rehabilitation program in New Bedford. After several years in the military, an experience that took her to Africa, Europe and the Middle East, Mitchell said she had great difficulty adjusting to civilian life. Mitchell said she is finding the support she needs in the women’s program to move forward with her life. Heather Aslin is one veteran who said she lost everything when she relapsed after eight years of sobriety while living in Monmouth County, New Jersey. A U.S. Navy veteran who has a long history with substance abuse and who suffered military sexual trauma, Aslin said the women’s program is helping her rebuild her self-esteem as she works on getting back into school to obtain a social work degree.